When I think of fall gardening, I think of a second spring. Recharged by the cool air, I’m fired up to do some planting! One of the reasons I really enjoy planting in the fall is that there is less thought to it. You just plant and go! At this time of year, plants are winding down. When you do plant, be sure to amend the soil with a good compost and mycorrhizae. Top-dress with some mulch, water the plants well, and Presto! Your plants are set! Since the plants require less watering at this time of year, you may not have to go back and water again. (It is still recommended to check the soil moisture daily, especially on warmer days.) Next spring, your plants will reemerge from dormancy, no hand-holding necessary. Ornamental grass, pansies, mums, pumpkins, corn stalks, straw bales, gourds, and asters oh my! Coloring your fall garden doesn’t get any easier! Use any of these items in mass groupings to give you big color and texture and big impact! One of my favorite fall plants is cabbage or kale. Early season they just look green, but once that cool air rolls in, WOW, that color really kicks into gear. The nice thing about the cabbage or kale is that the color will last right until snow falls. They can even sometimes be seen poking out from under the snow. What other type of plant gives you that kind of longevity! The garden in the fall is full of drama and grace. Here are some of my favorite plants that provide interest in this season of harvest. I’ve given my top three (or else this might never end!) for several categories. 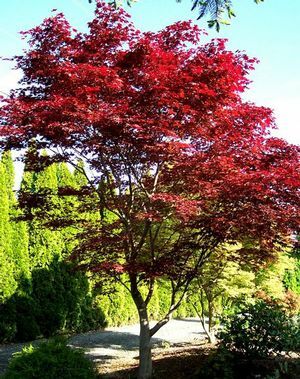 Fireglow Japanese Maple: When this maple goes into fall color you better have your sunglasses on! WHOA! 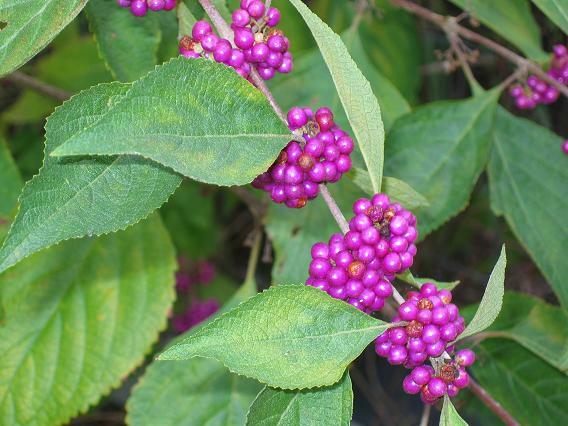 Beautyberry: Eye-popping iridescent purple clusters of berries all along the stem makes you say to yourself is this thing real? Sedum ‘Neon’ : The flower color is just that, neon! 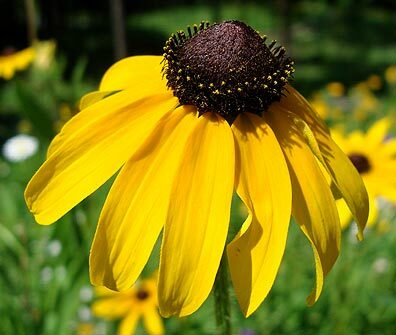 Black-Eyed Susan: Nice bright orangy-yellow flowers with a black center. I even like them when the flowers go by and just leave the seed pods. Makes a nice feast for the birds! So don’t forget, when fall arrives so does the next wave of seasonal color. Time to get out in the dirt and get that garden refreshed!